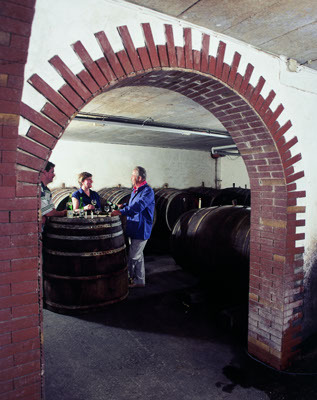 Our family has made wine in the Duchy of Veldenz for many generations. The climate and soil of the Mittelmosel region is particularly suited to the production of a high-quality Riesling. A wine-tasting evening, where you may sample the many different vintages in our wine-cellar, is one of the highlights of a stay at "Zur Muehle". You can sample both our Riesling and Kerner white, as well as our Dornfelder red wine. All our wines range from medium-dry to sweet. In cooperation with the Wine Estate Oliver and Nicole Kochan-Platz we offer you many wines of the varieties Riesling, Weißburgunder and Dornfelder red wine.